in association with the year end edition of the Hartland and West Country Chronicle. Cory, as he was known, was very much a local character. He was a Bible Christian lay preacher, easily divined from his full reporting of every event from the many chapels in his area, a teetotaller and member of the Band of Hope, secretary of the Rechabite tent, Insurance agent, member of many local committees:- Town Lamp Lighting, Carnival, Town Trust. He had made a promise to his mother when 18 years old that he would neither drink nor shave his beard. His photographs show him with a long straggly beard so no doubt kept both promises. He was the last of his line, his two sisters, like him never marrying. He died in Bideford Hospital on 3rd March 1956 aged 83. "THOMAS CORY BURROW was born in Harton (Hartland) in the year 1872, when the awful epidemic of small-pox claimed so many victims. Leaving the Board School at the age of 12, he worked at the painting, paperhanging, etc until 1890, when his father died. Going to Bideford he worked for Messrs. Prior, the late Mr. J.R. Pound, and Mr. C. Braund for some years. Returning home he continued the same line and added ironmongery. In 1886 the printing business was commenced as a side line, and gradually grew to such importance that the other business was discontinued. Succeeding Mr. T. Oatway he was for two years Clerk to the Parish Council, and Rate Collector. Mr James Andrew followed him and still holds office. 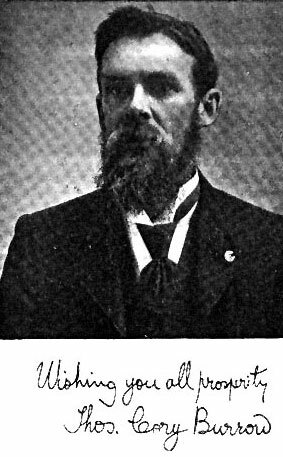 Mr Burrow joined the Independent Order of Rechabites at Bideford in 1890, and succeeded in instituting a "tent" know as the "Harty" here in 1897 and assisted in starting a Juvenile tent in 1902. He has been for some years a member of the United Band of Hope Committee and the Harton Town Trust, and he has recently joined the Street Lamp Committee. Interested in music, he passed the Elementary Tonic Solfa Examination at the age of seven, and has been for years a member of the Bible Christian and Temperance Choirs. About 8 years ago he was appointed correspondent for the Western Daily Mercury, Western Morning News, Daily Western Times, Devon Weekly Times, North Devon Journal, etc. These duties he still carries out. The Hartland Chronicle, first issued in October 1896 simply as a local cover for 100 copies of the Home Messenger, has gone on expanding in circulation and in the quantity of news until over 500 copies of an issue have been sold, and now there are 21 columns of local matter, each containing nearly half as many words as all the local portion of the first number. The first number was printed on a small wooden press weighing about 40lb. ; today there are over 3½ tons of printing machinery in the works. For years the magazine-newspaper was a source of loss, but at present is paying expenses, and advertising the increasing general printing business."